How does a 130-year-old household name, with over 500 brands, in 200 countries, with 200M customers, and 1.9 Billion products consumed daily, yes daily, transform HR? Beyond a refreshing drink in an iconic glass bottle, the glacial size of Coca-Cola is quite impressive with 20 of the 500 brands that are over billion dollars in annual revenue. This week I was delighted to host in our seventh Blue Prism Café Karla Younger, Vice President of HR Services, and Beth Cord, Director, HR Services at Coca-Cola. Karla and Beth are leading the HR transformation enabled by Blue Prism’s Digital Workforce Platform and putting the Human back into HR. A few years ago, Coca-Cola started using RPA in their finance division and from there started to explore what they should do internally, within other divisions. HR was a prime candidate and they started with 150 processes and explored how much automation could be applied to which particular processes and built a process candidate pipeline. Younger and Cord said they began the selection process by talking to the SMEs who owned the most manual HR processes. After covering questions including the volume, how often the process is handled, and how many hand-offs occur, they used a criteria process to determine which ones scored the highest for viability, which ones posed the greatest risk, how many people were involved in the process, etc. They also put up to 85 percent of their HR processes into an intuitive, online mapping tool. It enables them to have a single source of truth on everything related to each process. It’s really getting us to think differently about how the processes work. It’s also critical for RPA work, and anything else that we do from an automation standpoint. Coca-Cola’s HR group is currently running HR audits in SAP via Blue Prism. In the recent past they were running reports, getting them audited and spent time getting them into a format to then analyze exceptions, anomalies in the results and take action if the data had a bad mismatch for example. 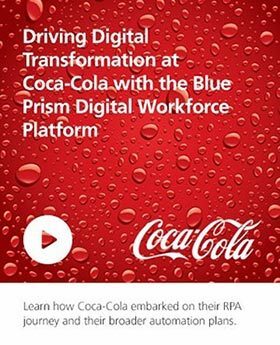 Fast forward that with Blue Prism’s Digital Workforce, Coca-Cola is now running reports that are delivered to their analysts and focusing directly on exceptions. Considering over 50 processes across multiple SAP systems, with multiple people touching them – this automation has been a huge time saving and is able to drive more focus on the data, than ever before. They are now able to stagger the deployment timing of these reports to load balance the work, but have the assurance that these reports are always generated, always coming to them. Also, they can now track them in a case management system to determine when things were delivered and actioned – something that was not possible in the manual process. In parallel, they’re testing background checks in the hiring process. Next up is a deeper dive into automating payroll processing and HR data elements. In prior years, the HR services team ran HR audits only for Coca-Cola Refreshments. But after the company’s franchising environment changed, it was responsible for auditing eight different sets of data. With Blue Prism’s help, they didn’t need to add head count to handle the expanded work, and the results are always completely accurate. And because Blue Prism was integrated with Salesforce.com, delivery of the results is automated, the data is securely stored, and they have full visibility into all the results. Blue Prism added capacity to get us from an 8-hour day to a 24-hour day, and improved accuracy because we no long just take a sample of the HR audit data. We can see every transaction that’s happening, and provide 100 percent coverage on that. Younger and Cord emphasized that HR services’ intent with automation is to remove time-consuming, transactional work, so they can dedicate more time on providing the human interaction and time needed to work through sensitive or complex situations with employees. We ran a poll of the 500 attendees of this webinar and asked the question, ‘which areas within HR are a priority for deploying RPA? Interestingly, 32% of the audience voted saying HR reporting was ripe for RPA, 24% said HR data, 21% said payroll,12% said talent acquisition and 11% said benefits. Of course, the discussion on the employee experience dovetailed into the possibility of replacing human employees with Digital Workers. But that’s not the plan at Coca-Cola. In fact, the HR services team months ago started planning for reskilling and moving individuals into more advanced roles as they automate the manual tasks and get humans doing more valuable, analytical work. Coca-Cola are prepared for the types of roles they would need, are training for the future skills, and their employees are enthusiastic about the opportunities that are in front of them. We want our employees to be on the edge of innovation. We want to be on that edge of innovation too, and driving creativity and opportunities. We might try something that doesn’t work, and we learn from that and move on to something that will work. I think we’re creating an environment that fosters this, and our employees are excited about it. Click here to view the webinar, and hear all the details Younger and Cord shared about Coca-Cola’s RPA journey.